Last year, I switched from a digital workflow to a – for now – film capture, and a digital scan workflow. Eventually, I will ban the digital part out of my work all together. And print in a darkroom again. A lot of people claim I am nuts. The reason why, for me is part aesthetic, and part emotional. Don't get me wrong. Technically, my images aren't any sharper than when I photographed with digital (I would even claim the opposite) but that is not the point of photography I think. If you get hung up on technical aspects of photography (sharpness, noise, how big is your sensor and how many megapixels do other photographers have available, ... ) then you might be one of those pixel peeper persons. My tip to you is: if you want to grow further as a photographer, you need to understand that you will eventually have to let those ideas go. Why? It is my opinion that if you don't, you will never 'see' beyond what that craft has to offer. But let's not make this a digital vs film debate. Because that's not what this post is about. But why do I like film? Well one of the reasons is it is a teacher of technique and pre-visualization that is UNFORGIVING. If you get it wrong. Your negative is toast. Everything I need to do before I press the cable release are mental exercises. In a way, it fuses my creative brain with my analytical brain. It makes me think about exposure, zone placement, aperture, depth of field, moment of exposure, the development proces, the printing proces, the emotional story I'm trying to tell, ... BEFORE I take the photograph. while composing a scene with the film camera. My camera is a box. A 'dumb box'. With a lens in front, and a film holder in the back. There is no in-camera light metering. No electronic level. No nothing. Bare bones. I can't just take a few snaps and hope for the best, review them on my LCD and go from there. Nope. Film is an incredible teacher. And it drives me to do everything better for the next frame, time after time. When I use it, it's me. If a negative didn't come out the way I envisioned it, I know it was me. I also take a lot fewer photographs with my Mamiya RB67 Pro-SD. I can take 10 on one roll of 120 film. I'm fortunate that film is still easily available. My film of choice is Ilford's Delta 100. It is contrasty just where I like it (in the mid-tones). 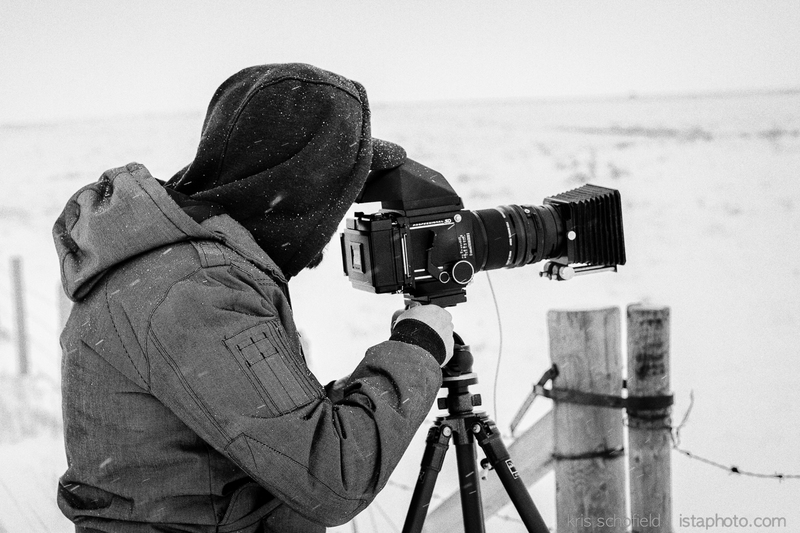 Pan F plus (50 asa) is the film to go to, for a lot of landscape photographers. Part for the contrast as for the fine grain. And although it is considered a high contrast film, I don't like it. The contrast is in the wrong place. So as a conclusion I would say, film is making me a better photographer. And I hear you say. 'But what you just said, can't you just easily adapt and follow that in digital photography too?'. Sure you can. I'm just telling you my story. With film I make 1-2 maybe 3 frames per scene. I used to do at least 10 with the digital. As a result, I am walking around scouting the surrounding a lot more now, usually before I pull out the camera. I feel film is far more rewarding than digital. For example, when you develop your film at home, I love the moment when I open up my film tank after the final rinsing process and hang the film up to dry. You feel like a million bucks when everything looks like you had intended it to look like. You should give it a try someday. It's a lot more fun. I can't agree more. As you rightly say, you probably have sharper, more detailed images with modern digital equipment. But this is not the point. Film slows you down and makes you think. And yes, opening up the tank is such a great moment. This makes complete sense to me especially considering the type of photographs you make, and the aim you have for them (artistic vs. documentary). Someone shooting a lot of stock photos may find this less convenient that digital. I do wish I could slow down more often with my digital shooting like I used to have to with film. Oh yeah obviously Michael. If I was a commercial photographer it wouldn't be THAT convenient BUT I'm sure, there's a niche for everything. Been there: done that. And I for one am glad to be rid of the pain, drudgery and frustrations of film. That said if shooting film is your thing then power to you. I enjoy the photos you make and the art lover in me doesn't really care how you made them. The photo-geek in me does care but that's a whole other issue that only therapy can fix. Keep up the excellent work. Photography should never be a frustrating thing Brian. I like art that shows me the artist's personality. That – for me – is one of the defining factors of what makes exceptional art, exceptional and good art, well just that, good. That is something – I believe – I can do with my B&W work. B&W feels like an extension of who I am. I have no explanation why this is. It just feels right. Now what medium I desire to use is completely secondary. I've been called an elitist before, for using film. But I believe that the medium an artist desires to use should never influence the viewer's opinion about the artist's art. It's not because I use film that my work becomes better. Or even letting the viewer believe that the artist is better than him, because he/she uses film. Those are crazy assumptions made by people that have no clue what photography is about. Thank you for your nice words about my work. I appreciate those a lot. Thank you. Good post, well said....I really like using film myself. I have been working at newspapers as a photographer since I was 18 years of age, I started out shooting black and white film in my Nikon F2 camera. Today its all digital and I must say that I love shooting digital for my newspaper work, in November of 2001 my newspaper, The Kelowna Daily Couruier bought the newest of new, Nikon D1H digital cameras, I can still clearly remember walking along Bernard avenue in downtown Kelowna the day our 'kits' arrived and shot anything and everything that moved, I would look at each picture on the camera's tiny little rear screen and say wow! I would never want to go back to film for my day to day work assignments at the paper . Digital is a must in photojournalism, I wouldn't want to be with out it. Shooting film on my time off is a whole different kettle of fish, for one I have no deadlines to contend with, so it doesn't matter to me that I can see the shot right away, I feel as an artist ( which I humbly realize may not be true ) I want to slow things down. Twenty-five years ago I picked up a 4 x 5 view camera, people in the news biz might not have quite understood what I was doing, some thought I was completely nuts, I still could be. I totally love making images with my view cameras, mostly 4 x 5 but when I can afford the film my 8 x 10 that too. Over the years I have own medium format cameras, but I have stuck with view cameras, almost all the work you see on my website, my blog and FB page is done with view cameras. I am frequently asked, why film and why a view camera? , some think its bulky, time consuming not easy to use. One of the things that I have found that with shooting film is not so much that it makes me a better photographer but that it clearly makes me look at and photograph my subject(s) in a far different way than using digital, its hard to explain, I am much more selective in terms of how I will photograph my subject when shooting with film. Also I love shooting with the view camera and I have not found a digital equivalent, to me there is nothing more beautiful than looking at my composed image even though it is upside down and backwards that I am abut to record with film on a ground glass screen 20 to 80 square inches in size, its really beautiful to look at, its the direct image coming through the lens, a truly 'raw' image. These days I work with a hybrid system or a digital scan-workflow, I shoot sheet film and scan the negatives with flatbed scanner. I also hope to do some more connect sheet printing in the wet darkroom from my 8 x 10 negatives one of these days too, I have always been inspired by the work of Edward Weston, including the simplicity of his craft in making his wonderful images, his darkroom consisted of a few trays, printing frame and darkroom lights, he was able to set up almost anywhere. I would say that shooting film may be a little crazy in this digital age, and may seem like the hard way to an end product when the easier route is the one to take, but then so is running a marathon, there are a lot easier ways to cover the 26.2 miles by pounding the ground with your feet. Also I feel that there is a sense of accomplishment in that some film cameras are not easy to use, neither is playing a violin, it takes years to get good at playing such an instrument, but the effort is well worth it, in terms of one's personal satisfaction and knowing that you have worked hard for something. Ich bin froh, auf Ihre aufstrebenden Art des Schreibens die Post zu finden. Jetzt machen Sie es einfach für mich zu verstehen und umzusetzen, das Konzept. Vielen Dank für die Post.